It’s a well-accepted approach in sports that the fastest way to a finish line is with negative splits—i.e. to get faster as the race progresses. In the ultrarunning community, this approach more resembles a sacred mantra than a mere guideline. A couple of days ago, I found myself asking, How good are ultrarunners at following this advice? To answer this question, I looked at the splits from last year’s Western States Endurance Run. A 100-mile race from Squaw Valley to Auburn, CA, this is one of the premier events in the ultracalendar and often features a fairly stacked field of elite runners. From the perspective of answering my question, this race has several benefits. A runner has to qualify with at least a 50 miler, and so this isn’t anyone’s first rodeo. The race has also been around for 40 years (!! 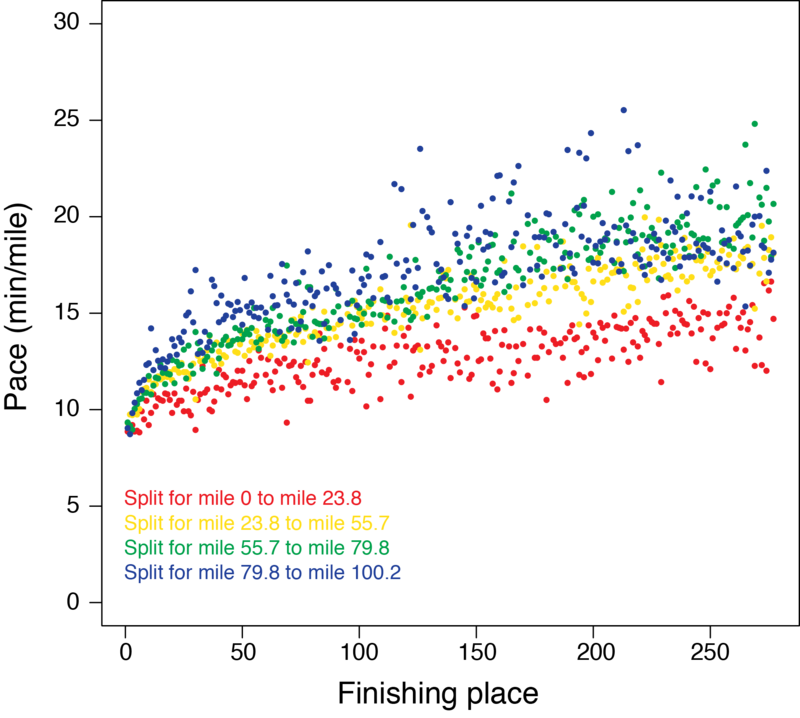 ), which means many different datasets, spanning generations of ultrarunners and a wide variety of race conditions. Western States is also thought to have a faster back half, thus providing the perfect opportunity for negative splitting. And, finally, I was at this year’s race, crewing for my coach, Ian Sharman, and I’d be lying if I said that I weren’t still riding that wave. What was immediately clear is that all of the red points (representing the speeds in the first 24 miles) are pretty well separated from the other three colors, especially for the later finishers. In other words, for nearly all runners, they ran faster in the opening quarter than in the rest of the race. So here’s the good news. For every ultra runner who can relate to that feeling of hemorrhaging time in the second half, of just barely hanging on: you’re not imagining things, and you are most definitely not the only one. And here’s the bad news: only ten runners (of 277 who finished) were able to negative split Western States. This is a game of minimizing losses. To see the slow-down a bit more clearly, I next separated the runners by their finishing position, and then looked at their pace in each quarter of the race. It’s hard for me to look at this plot and not think that pretty much every single runner (with the exception of the top 10, maybe 20) is going out too hard. I mean, way too hard. For instance, take the 151-200 group: the slowest pace in the first quarter for this group was faster than the quickest pace in the second quarter of the race. 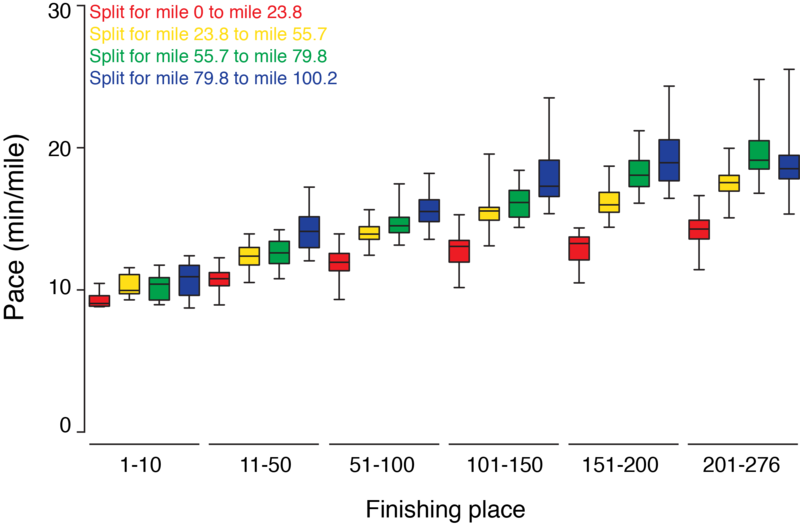 The median first quarter pace for those runners (13.3 min/mile) was closer to what the elites were doing at the start (9.1 min/mile) than what those same mid-packers did at the end of the race (19 min/mile). As an ultrarunner, I’ve got to say that this is a rough graph. People are going minutes per mile slower at the end of the race. And there are several runners whose difference in speeds is larger than the speed they had in the first quarter. Yeah, “hemorrhaging time” sounds about right. So let’s call a spade ‘a spade’ here. Most runners just have no business throwing down 13 min/mile splits in the beginning of Western States. And yet more than 50% did. As I said, some pretty rough numbers. Let’s take that same 151-200 group: their pace was, on average, 50% slower in the last quarter as it was in the first quarter. The only group that seems to escape relatively unscathed is the elite, top 10 group. Although even these, as a group, get slower through the race—they just slow down a lot less. On average, runners went 20% slower in the second half of the race. So much for negative splits. In a sense, though, these results aren’t news: pretty much every ultrarunner knows that paces that felt easy in the beginning can be impossible to hold onto at the end. Yet, what I find most surprising is that, despite knowing this, experienced runners still went out too hard. By a lot. So for my next ultramarathon I’m going to go out slow. Slower than I think I should, even after writing this post. Because there is one bright side. If I pace myself right and manage to slow down by only 10% in the second half, I’ll be beating the house, and I’ll pass a lot of runners. And that sounds like a lot of fun. The runners are greeted with 2000 ft of ascending and their maximum elevation in the first four miles. Yeah, you really do slow down that much. The numbers don’t lie. For the non-ultrarunner. I know, these paces seem pretty darn slow. But take a look at the race profile: runners climb more than 18,000 ft, and descend around 23,000 ft. And, although it may sound easy, holding a 15-minute-per-mile pace through the mountains for over 24 straight hours is hard. In fact, I should probably apply a variant of Hofstadter’s law quite liberally here. ← Numbers are important. So is scale. 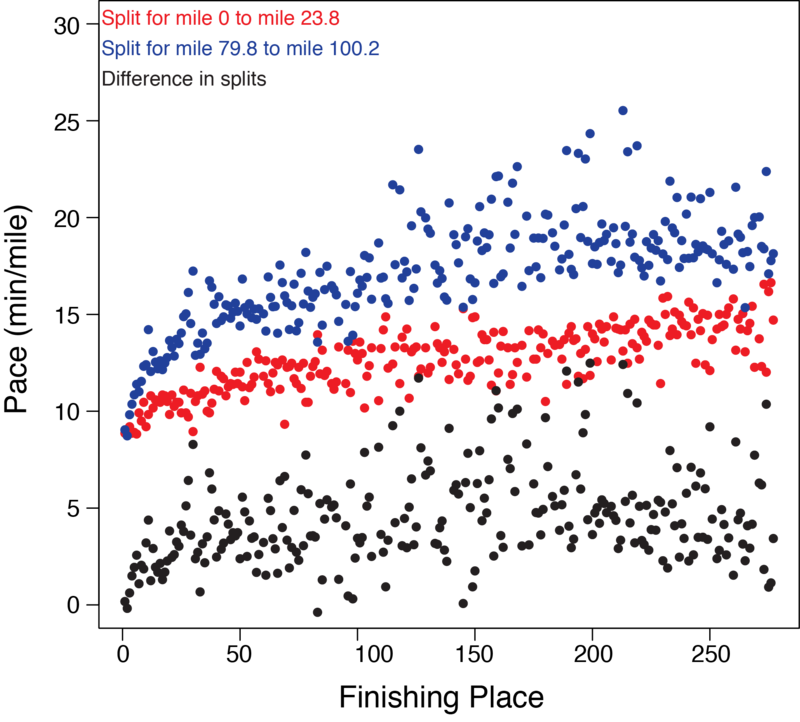 Nice data, but this assumes that going out slower results in a steadier pace for the race, which may or may not be true. Why is more beneficial to run a steady 14 min/mile pace than starting with a 10 and ending up with an 18? I think there is a lot truth to many starting out too fast — but most of the too fast starters end up blowing up and not finishing the race. 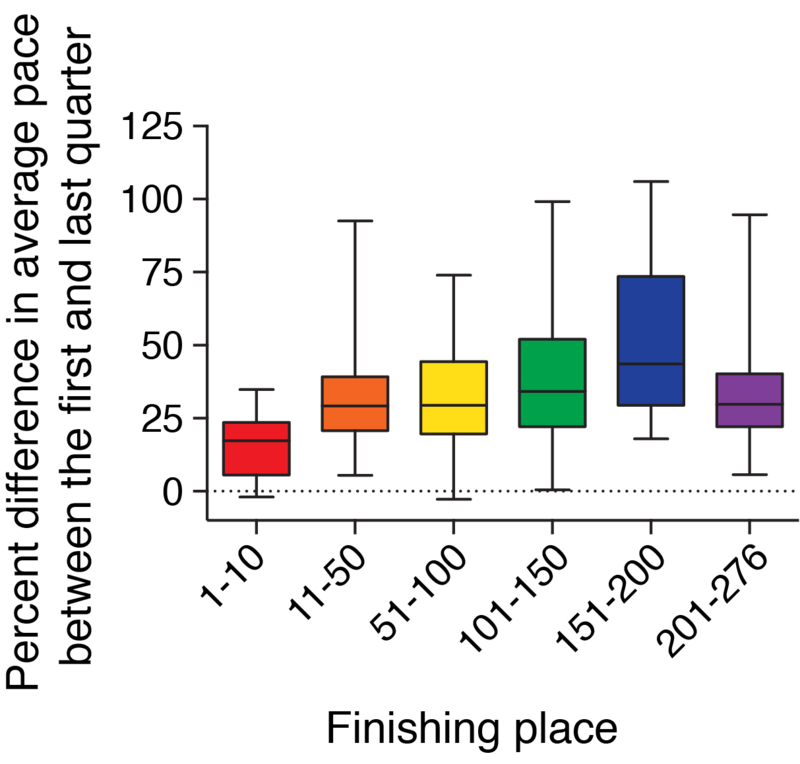 I would like to see data that shows the relationship between pace and sustainability. I think there is a point where you are maximizing your sustainability, and after that point you are no longer increasing sustainability. Was I one of the 10 that negative splitted? Going up the initial climb to escarpment, I was near the very back but I passed a ton of people from the river to the end. Have you considered fitting a curve to the paces for each quarter of the distance and the comparing the residual between the first quarter of the race and last? This would give you a picture of how going out faster than the mean affects your pace in the last quarter. I know that Ian feels that the fastest 50 mile race is best done with an even or negative split but I don’t agree entirely. Yes, you do see it at Comrades, but I certainly don’t agree for 100 miles and haven’t seen it happen at any mountainous trail race. The conclusion that “everyone is starting out too fast” is really not true or rather partly untrue. Fatigue is such a tremendous factor at this distance for EVERY runner (including the winners) that the important variable is not pace but EFFORT. I have analyzed the heart rate data of several top runners and the story is different than what you see by looking only at pace. Brett Rivers (M8), for example, slowed down like everyone else but kept his average heart rate for the entire race pretty close to what it was for the first half (and had the race of his life). That is fairly extraordinary. Max King (M4), myself (M16), and Larisa Danis (F2) all had a fairly precipitious dropoff in heart rate (and hence, effort) in the last 40 miles. Bottom line is that I wouldn’t recommend that the average runner attempting to run a realistic goal PR pace for 100 miles (or even 50) start out at that pace. Nice data collection. However, you’ll notice that even 1-10th place winners have faster 1st quarter times than other quarters. Whats more, their 1st quarter paces are faster than any of the 10th-100th runners. So, they are not winning by negative splitting — they are winning by running faster across all quarters. What this shows, it seems to me, is that *all* runners start faster when they go out. But is this a bad thing? Since even the winners are doing it, you can’t conclude that its bad to go out fast. You would have to show a different set of winners that are winning *because* they are negative splitting, which I don’t think this data shows. Negative splitting could be a race winner, for some, but one thing clear in your data is that the most important thing is running faster, overall. Running at night is slower for most people. To echo the comments of others, negative or even split isn’t neccesarily the fastest way to run. Further research would be required to determine what the optimal spilt should be. However I do agree with the gist that most runners set off to fast. There was a recent study of a very large sample of marathon runners that showed females tend to pace themselves better, and that the average 2nd half split performance was about 85%, but much higher in elite athletes- about 94%. So I suspect optimal pacing should be much closer to this elite number. I think a race like WS100 is one of the worst to draw conclusions from regarding pacing. Altitude, weather, the overall profile of the course make it impossible to get good pacing data. Of course it is true that a lot of ultrarunners start too fast but I don’t think an even pace is the solution. The pace will always be higher in the beginning. This is not a Marathon over 2:10h. You have to get nutrition in and change clothes over 15 minimum (at WAS100). All things you don’t do if you run a Marathon. And I would think that negative splitting is even more inefficient in an ultra unless the course is a lot easier in the second half. I couldn’t agree with you more. All of my best races, from marathon to 150 mile 24 hour races, have been run at an even, or close to an even pace. I have watched thousands of runners throughout my 99 races of marathon or longer and I have studied the splits for the Leadville 100 race for many years. I can absolutely, unequivocally say that running at or close to an even pace is the best way to ensure the best performance you have in you. It doesn’t matter if you’re an elite, or a back of the pack runner.